In 2001, I attended my first American Mountain Guides Association Annual Meeting in Yosemite Valley. I was standing at the campfire, looking for someone to talk to. I didn't really know anyone as I hadn't been guiding very long. Doug is an incredibly well-known and respected climber and guide. 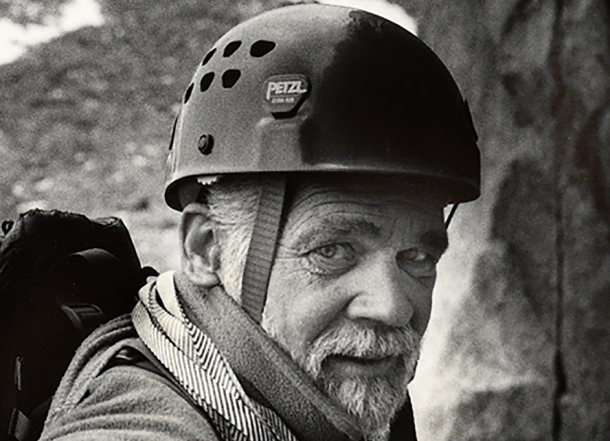 He was at the forefront of the "clean climbing" movement in the early 1970s. He pushed back against the use of rock-altering pitons in favor of equipment that didn't damage the rock. In his essay, “The Whole Natural Art of Protection,” he argued for the use of "chalks" or what we refer to now as wired nuts in lieu of pins. Doug did more than lecture his contemporaries. He practiced what he preached. In 1973, he made the first clean ascent of Half Dome. This and the subsequent article in National Geographic magazine cemented his place in climbing history. In addition to leading the clean climbing revolution, Doug has been responsible for dozens of first ascents in the Sierra. Most notably, he made the first ascent of Dark Star on Temple Crag, made the first ice ascent of V-Notch Couloir, made numerous first ice ascents in Lee Vining Canyon, made the first ascent of Ice Nine, and finally he made the second ascent of Ama Dablam (22,495') in Nepal. Because it gets us high. and beta-endorphin isn't behind the runner's high either. at work deep in the brains of adventure athletes. The book is an exploration of brain chemistry through the lens of adventure sports. Doug looks at skiers and runners and climbers and delves into the complex cocktail of brain drugs that induce feelings of euphoria when climbing or the "runner's high." There are five hormones that are released into the brain to create the feelings that we strive for in the mountains. They are noradrenaline, anandamine, serotonin, DMT, and dopamine. Each of these are released for different reasons. Note that adrenaline was not one of the hormones on the list. Adrenaline is a "fight-or-flight" chemical. It generally comes in a rush when something very dangerous almost happens. It is not really what people strive for in their mountain sports, the idea that climbers are "adrenaline junkies" is completely false. The Most Dangerous GoPro Footage Ever Shot!!!! !